Yellowstone is home to many different organisms. Each organism plays a vital role in the park's ecosystem. To the left is a food web, which is a visual representation of the energy transfer of Yellowstone! Producers, shown at the bottom of the web, provide a food source for primary consumers, which are shown on the second level. Secondary consumers consume primary consumers and secondary consumers are consumed by tertiary consumers. The food web you see is a very small and general representation of the Yellowstone ecosystem. Some of Yellowstone’s most popular producers are wheatgrass, pond lilies, lodgepole pines, quaking aspen, green algae, and gray willow. These organisms are autotrophs, meaning that they make their own food. These organisms serve to produce food for organisms higher on the food chain. Yellowstone National Park is home to a multitude of primary consumers. Primary consumers are organisms that get their energy from producers (autotrophs). They are considered the first heterotroph on the food chain. Included in the food web above, the primary consumers include pronghorns, beavers, elk, cutthroat trout, mayflies, and deer mice. These organisms are a very vital part of the food chain because they keep producer populations under control and provide a source of energy for secondary and tertiary consumers. The secondary consumers of Yellowstone are osprey, bald eagles, bighorn sheep, grizzly bears, coyotes, red-tailed hawks, and bison. Secondary consumers are organisms that get their energy from primary consumers and producers and provide energy for tertiary consumers. These organisms are heterotrophs, or organisms that get their energy from another source. Tertiary consumers are organisms that feed primarily on secondary and primary consumers. These organisms are at the top of the food chain. The gray wolf is one of Yellowstone’s tertiary consumers. A keystone species is a species whose effects on the composition of communities are greater than one might expect based on their abundance. The stoic and majestic elk is the keystone species of Yellowstone National Park. Elk are the most abundant large mammals found in Yellowstone. Paleontological evidence proves the continuous presence of elk in Yellowstone for 1,000 years. In the summer, there are roughly 30,000 elk grazing in the park. Elk serve as a predominant food source for many other large mammals in the area. These mammals include grizzly bears, coyotes, black bears, and golden eagles. In addition, mountain lions affect the elk population in the northern section of the park. If elk were removed from the park or the population were to decrease, the populations of the elk’s predators would be affected. For example, if the population of elk were decreased by disease or natural disaster, wolves and coyotes, would experience difficulty finding elk to feed on. There would not be many elk to prey on and the predator populations would decrease proportionately. In addition, grasses and certain trees would experience population increase because elk are grazing mammals. Similarly, an increase in the elk population would cause an increase in its predator populations. The predator populations that hunt and feed on elk would have a larger food source. The increase of a food source provides more food for the entire population, which would allow individuals to survive and reproduce. Therefore, the predator populations would increase with an increase of elk. There are many elk in Yellowstone National Park currently and they play a vital role in the ecosystem around them. Visit Yellowstone to witness the elk in their natural habitat and learn more about these fascinating animals. The Grizzly Bear is a North American subspecies of Brown Bear. The bears are usually brown, but their fur is sometimes white-tipped, or grizzled. This lends to their traditional name. On average, grizzly bears grow to heights between five and eight feet. The bears’ body features include a prominent shoulder hump, large head, and long claws. Their claws are well-suited for digging. The grizzly’s shoulder hump is an area for massive muscle attachment to the backbone. These muscles assist the bear in digging. On average, grizzly bears weigh upwards of 700 pounds. Female grizzly bears weigh up to 800 pounds, whereas males can weigh up to 1,700 pounds. The face of the grizzly bear is distinguished by a dished face and short, rounded ears, a tapered snout, and narrowly set eyes. They have very thick, powerful legs and particularly massive forelegs. Grizzly bears are curious, intelligent, and possess an exceptional memory, especially when food sources are involved. They are active during both day and night. However, these intelligent bears often change their behavior based on the concentration of humans in their living areas. During the hottest point of the day, grizzlies are often seen resting in areas of dense vegetation, including tall grasslands and dense forests. For the most part, these bears spend a majority of their time alone. However, when raising cubs, females are often accompanied by their offspring. Grizzly bears are omnivores. This means that they take in a wide variety of foods. Though “top of the food chain predators,” grizzly bears tend to consume large quantities of nuts, berries, fruit, leaves, and roots. Insects make up a large part of the grizzly diet. The bears will also consume other animals such as small rodents and moose. In addition, fish are an important part of the grizzly diet. They are highly adaptable when it comes to their diet. Many of the foods that they take in are seasonal and the bears are forced to move to find available food for that particular season. Ingestion of large amounts of food in short time frames is critical to the grizzly survival. It is important because grizzlies are only active and feeding for six to eight months every year. Grizzly bears are often victims of human hunting. Human encroachment is one of the most prominent reasons of grizzly endangerment. Historically, grizzly bears have been heavily persecuted because they are viewed as a threat to human safety. The bears have experienced excessive mortality rates due to the interference of humans. To this day, these bears are hunted for their fur, paws, and gall bladders. Grizzly bears are in need of wide, ranging, and undisturbed land areas for survival. Recreational development, oil and gas development, roads, and timber harvest are major factors in the grizzlies’ threatened status. Their habitat is being taken away, which has swiftly put the grizzly bears on the endangered species list. In addition, agriculture has taken away from the grizzly’s land. Grizzly bears reside predominantly in the Western United States. The west supports a small population of grizzlies, ranging from 1,400 to 1,700 individuals. In the early 1800s, the estimate of grizzly bears in the United States was approximately 50,000. However, as time past and humans began to move west, the grizzly bear population dwindled. Since 1998, 398 grizzly cubs have been produced in Yellowstone National Park. Yellowstone has the greatest southern population of grizzlies. The number of grizzly bears in Yellowstone is slowly climbing further out of endangerment. 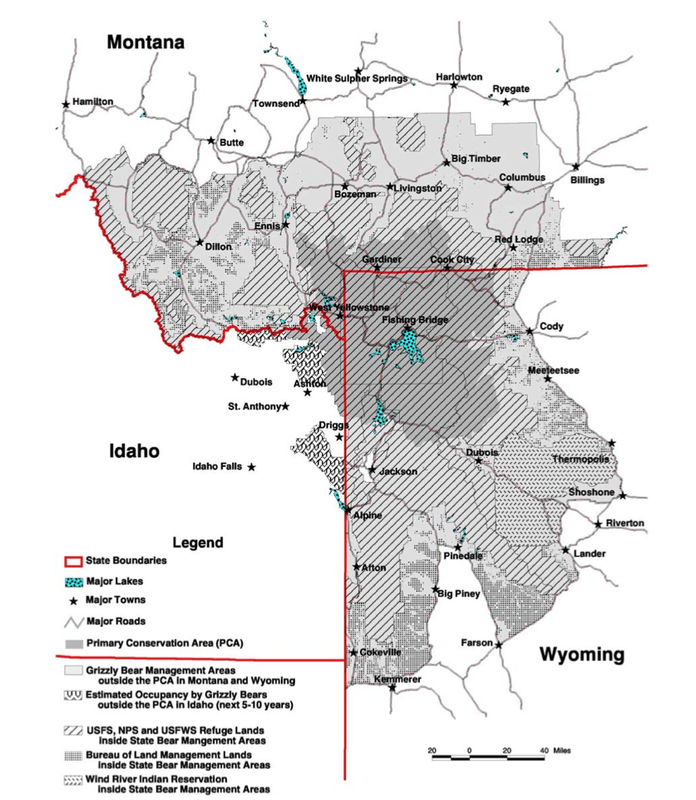 In 2011, officials estimated 593 grizzly bears living in the Greater Yellowstone Ecosystem. The National Wildlife Federation has taken a strong role in the grizzly bear recovery. The federation actively works to ensure the peaceful coexistence of grizzly bears and humans. With their Adopt-a-Wildlife-Acre program, they work to secure land outside the boundaries of Yellowstone National Park to expand the animals’ habitat. They also work to monitor the grizzly population and ensure that it is protected. The Fish and Wildlife Service has worked to educate Yellowstone visitors about the importance of the grizzly population. Their 2002 Conservation Strategy also includes the conservation of the bears’ current habitat as well as habitat expansion. 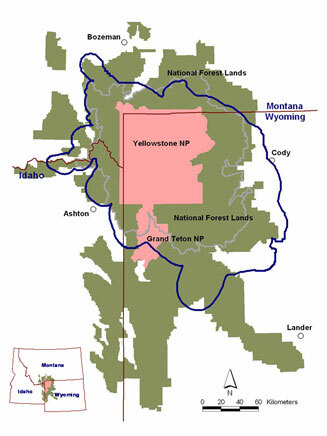 In addition, Wyoming state laws also protect the grizzlies in Yellowstone National Park and outside the park boundaries.